So how did we bypass this costly apparatus and assert control of the publishing process? How did we produce an affordable, highly shareable 400-page book? By looking to our international community of commoners. We did a private crowdfunding outreach to solicit orders for advance bulk orders -- $10/copy in increments of ten. This raised enough money to finance about half of the cost of the print run of 2,000 copies. Silke and I personally paid for the rest of the print run, which we expect to recoup after selling a few hundred copies. We were able to reclaim control over what happens with our book and avoid the strict limitations imposed by conventional publishing business models. We built on the logic of commoning: First, build community (which took years of work), then support each other. This is both more efficient and socially satisfying than relying on highly consolidated corporate markets that require ever-escalating prices, control and sales. 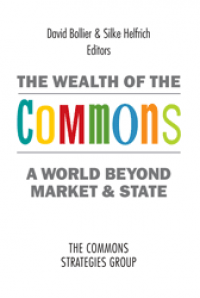 We had had a great experience in publishing The Wealth of the Commons in 2012 via Levellers Press, a regional press that took a chance on our book. Levellers was started a few years ago by its parent company, Collective Copies, a worker-owned, movement-friendly photocopy business in Amherst, Massachusetts, US. So when it came time to publish Patterns of Commoning, we could have published with Levellers, but decided this time to go with Levellers’ self-publishing arm, Off the Common Books. The big difference was that we, as authors/editors, put up the money ourselves to print and distribute the books. Off the Common Books then sells and ships the books for a modest per-book fee. Publishing Patterns of Commoning ourselves has been a wonderful liberation from the costly, unresponsive machinery of traditional publishing. Even though our book is not available through most bricks-and-mortar bookstores, that’s okay; very few books are. 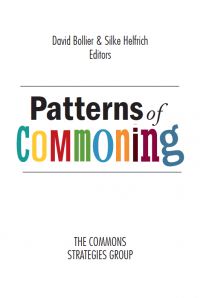 Patterns of Commoning can be bought directly through the Off the Common Books website – our preferred source – or through Amazon (not preferred, but it’s hard to reach general book buyers otherwise). Because our overhead costs are so low, we were able to keep the price of our book at $15 – much lower than a conventional publisher would charge – while pocketing higher revenues than typical publishing deals (a scant 7-10% of the cover price). We can break even sooner, and enjoy fewer risks and costs because we have a smaller press run. Then there is marketing. The authors of books usually end up doing most of the marketing because they know their reader-community better than most publishers. Authors are motivated to reach out to readers, but US publishers entering a publishing season often have “more important” titles to promote than one’s own book. “Lesser titles” are often left to fend for themselves. 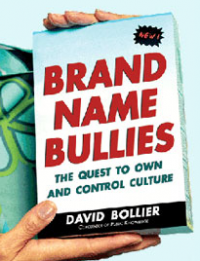 When I published a book (with coauthor Burns Weston) with the esteemed Cambridge University Press, several people cycled through the job of marketing my book in the course of only two years. The Press initially charged $85 for the hardback copy (now $55) because it apparently sees university libraries as its primary market for hardcover sales. When it was time to publish a cheaper ($35) paperback, the Press refused to correct the typos (“too expensive”) or even include an errata sheet. Self-publishing in collaboration with our commons network let us avoid all of these problems. We have been able to rely on our own network of commoners, Web visibility and word-of-mouth recommendations – avoiding the expensive and mediocre outreach and promotion that many publishers do. 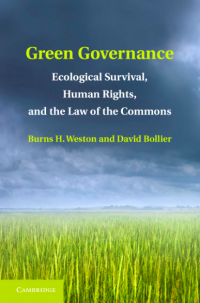 We have also been able to use a Creative Commons license (in our case, a CC BY-SA 4.0 license), which authorizes foreign translations for free and lets us post the entire book online. (Chapters will be posted in the next month or two.) We value impact and connection over profit. Of course, as non-academics, Silke and I don’t need to worry about the perceived prestige of a publisher. Our careers are not dependent upon getting published with the most respected academic presses, which may also be expensive, averse to Creative Commons licenses, and focused on traditional marketing approaches. I do think this commons-based model represents a superior commercial model for movement-oriented books so long as you have sufficient inhouse editorial and production know-how. You can make your own choices about editorial content, control your own marketing, reap more of the revenues from sales, and use a Creative Commons license. You don’t have to forfeit so much to a publisher and the commercial distribution apparatus. In our case, it was crucial to have a partner like Off the Common Books, an author-friendly, movement-oriented cooperative. Let me quickly mention a second commons-based book publishing experiment now underway. 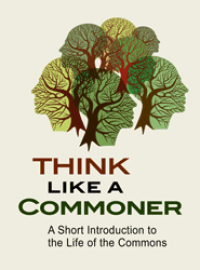 This project revolves around the Spanish translation for my 2014 book, Think Like a Commoner. The book is licensed under a CC BY-SA license, which means that translators can do a translation for free. So far, there are translations in French, Italian, Polish and Korean – with a Chinese one in progress. Last year, a consortium of commons-oriented groups in Madrid organized by Guerrilla Translation – Stacco Troncoso and Anne Marie Utratel – decided that they wanted to translate Think Like a Commoner as a collaborative project. The consortium includes the Medialab-Prado, free software publisher Traficantes de Sueños, the commons crowdfunding website Goteo and the translation team of Georgina Reparado, Susa Oñate and Lara San Mamés. This group, coordinated by Guerrilla Translation’s Xana Libânio, is mounting a crowdfunding campaign to pay for the translation, campaign management, and book editing and design. Contributors can choose from among numerous rewards, including copies of the book. What’s especially imaginative is how the Spanish translation project is engaging with publishers in Latin America to print, distribute, promote and sell the book in their various countries – Tinta Limón in Argentina, La Libre in Perú, SurSiendo in México. Publishers will print a set number of copies for the initial crowdfund distribution, but will then be free to print and sell additional copies for their respective countries. I am grateful to the Madrid team that has undertaken this project, and impressed by the creative structures and cooperation that they have devised. It makes me wonder if the time is right to start a standing press on commons and movement concerns. That would surely require more resources and reliable revenue streams, but it is certainly worth exploring. The economics of conventional publishing is delivering less and less value to authors and readers even as book prices go higher. Meanwhile, important new books never get published in the first place because they are deemed unmarketable. 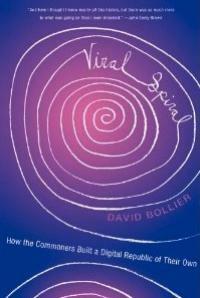 We have a chapter in Patterns of Commoning that describes some of the more notable commons-based publishing innovations out there. Besides open access scholarly publishing, there is Oya magazine in Germany, Shareable in the US, Pillku in Latin America, among others. Maybe it’s time for a commons-based publishing summit. So your statement, "Their [distributors] cut leaves about 40% of the cover price or less for the publisher, author and retailer to split," is simply incorrect. The publisher gets at least 45%, & usually more, to split between the author & itself. I suspect you're confusing Amazon's terms with distributors -- & bookstores as a rule don't--can't & won't--order from Amazon. I'm not sure that it's public what percentage Amazon takes--I think the big publishers can negoatiate a bit, but by all accounts it's more than Ingram or Baker & Taylor (the two largest national distributors that we deal with.) And of course Amazon income leaves the community where it stays around for small independent bookstore. On a side note: in the 1980s when I ran a pretty exclusively academic bookstore, some of the major university presses (I'm thinking of University of Chicago Press in particular, but this applied to others as well), would often have print runs of 300-500. What I thought remarkable at the time, was that my little store would order some 20 copies of many of those titles--a sizeable percentage--& sell them all. And that was before print-on-demand publishing became possible & then commonplace. For example, Columbia University Press & University of California Press, among many others (not to mention Amazon), are all printing books on demand.